This year, on 31st August 2018, the auspicious day of Pujya Bhaishri’s birthday, Pujya Bhaishri celebrated his birthday with the tribal students of Saputara at Sandipani Vidya Sankul, situated in Saputara in Dang District. 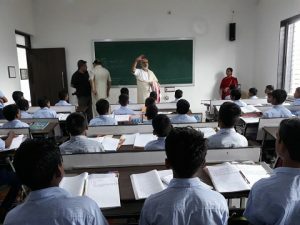 Pujya Bhaishri spent three days with the students out of which he educated them on the setup of the Indian Government and politics on one day. 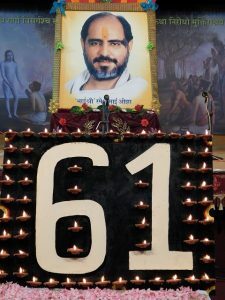 In the 60th celebrations of his birthday, Pujya Bhaishri had said that going forward, his birthday will be celebrated in a simple manner. The day was spent bringing a smile to the students’ faces when clothes and sweets were distributed to them. 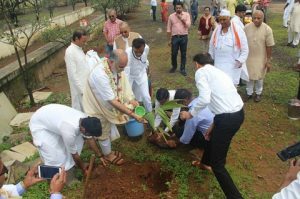 Pujya Bhaishri, the students, teachers and devotees also spent time on tree planting spreading a message to all to preserve mother nature and go green. 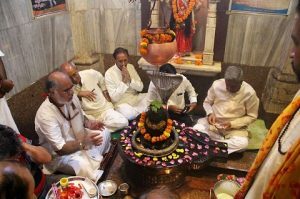 Thereafter worship of Lord Shiv with abhishek amongst Veda mantras and ślokas was completed at Nageshwar Mahadev Mandir in Saputara. Present in these divine but simple celebrations were Shri D. H. Goyani, Sandipani Trustees Shri Bajaranglal Tapariaji, Shri Gautambhai Oza, Shri Tusharbhai Jani, Industrialist from Surat, Shri Luvjibhai Badshah, Shri Mahendrabhai Katargam, Shri Karunashankarbhai Oza and Shri Rameshbhai Janani. Watch Pujya Bhaishri’s video on his Sandesh (message) on the day. Pujya Bhaishri advised all to do seva anywhere and wherever we get time, whether it is making someone happy, providing education, service to the country or even the environment. We have celebrated today in a divine atmosphere with progress in service to the environment. 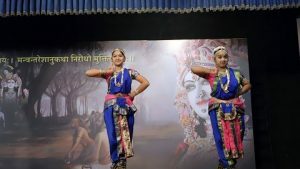 Although missing the association of Saints and their blessings carried out every year, Pujya Bhaishri said that he had been bestowed their blessings over the phone continues to experience them. 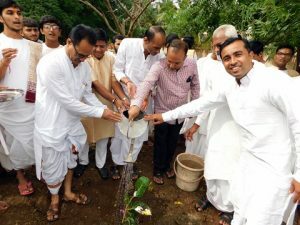 At the same time, Sandipani Vidyaniketan in Porbandar celebrated Pujya Bhaishri’s birthday with tree planting and a cultural programme.